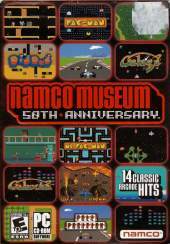 Namco is honoring its 50th anniversary by releasing this compilation of arcade classics. It was founded in 1955 as an operator of "rocking horse" amusement rides. Namco has been in the video game business since 1974, when it acquired the Japanese division of the original Atari. Using a retro interface, you check out a virtual arcade hall where you can select each classic in its original arcade cabinet. The 16 games included are: Pac-Man, Ms. Pac-Man, Galaga, Galaxian, Dig Dug, Pole Position, Pole Position II, Rolling Thunder, Rally X, Bosconian, Dragon Spirit, Sky Kid, Xevious, Mappy, Galaga '88 (unlockable), Pac-Mania (unlockable).